Cinderella, whether in the version of the Brothers Grimm or of that of Perrault, is an uplifting tale of virtue overcoming adversity that lends itself perfectly to the romantic nature of classical ballet. Or at least it did; perhaps it is contemporary sensibility that militates against the creation in balletic form of fairy tales with their wide-eyed wonderment and youthful innocence. Christopher Wheeldon’s version of Cinderella that the Dutch National Ballet brought for the first time to the UK at the London Coliseum last week as part of the Sadler’s Wells season still uses Prokofiev’s uplifting score to anchor its heart (and it still does, despite the editing to fit Wheeldon’s and Craig Lucas’s libretto), but his choreography has a sense of artifice that inflates subtlety into exaggeration. Nothing illustrates this better than the entrance of Matthew Golding as the Prince into Cinderella’s lowly cottage in the third act. He has been searching for the girl with whom he has fallen in love at the Ball and who mysteriously disappeared at the stroke of midnight without a trace — except for a golden slipper. The Prince is visiting everyone on his guest list to find the foot (and the girl) that matches this slipper and he springs into the room like a bull (one can imagine him preparing along the pathway outside) in a series of jetés culminating in a double saut-de-basque and a flourish in the middle of the kitchen. The exaggeration of the step and the seriousness with which Golding performs it is pure Camp. I am not suggesting Wheeldon is making fun of the situation but it does suggest a failure to get to grips with the fairy tale on its own terms. The fault is not helped by Golding’s difficulty in finding subtle shades of princely character. The one time the Prince relaxes is when he is played as a young boy by Mingus de Swaan (a student at the National Ballet Academy Amsterdam) dashing along the palace corridors wooden sword in hand and jumping over the back of the sofas. What happened, one wonders, to that prankster charm in the older prince? It resurfaces briefly in the first act when he mocks the ancestral portraits and when in the guise of his equerry he mimics the stepsisters in front of Cinderella but later at the Ball when the music wills him to soften in the presence of the effulgent Cinderella Golding gets all serious in the partnering demands Wheeldon imposes that leave no room for (dare I mention it?) an expression of tenderness. This leaves Cinderella (Anna Tsygankova) in a fix because she doesn’t get a chance to see the Prince — let alone communicate with him — as he manipulates her almost clinically across his back and over his shoulders in what is a show of lifts and steps rather than a show of relationship through the lifts and steps (something Sir Frederick Ashton was brilliant at doing with equal artifice but more subtlety). With such a tentative chemistry between them, the fairytale loses its heart. The one character to whom Wheeldon gives a sense of freedom is the Prince’s friend Benjamin (Remi Wörtmeyer) who keeps in character with his rambunctious younger self (Floris Faes) while pulling off some of the most challengingly fluid variations of the evening. But he is not allowed entirely off the hook: he falls rather improbably for stepsister Clementine (Nadia Yanowsky) who has been used by Wheeldon for comic purposes (along with sister Edwina and mother Hortensia) to the point of caricature. It is as if Wheeldon has worked with each of the characters separately in different rooms without developing a credible relationship that unites them over the three acts. This is not the case for the scenic elements. Thanks to the team of Julian Crouch, Basil Twist, Natasha Katz and Daniel Brodie one scene flows imaginatively and seamlessly into the next through a scrupulous balance of lighting (Katz), scenic elements (Crouch) and video projection (Brodie) — even if the projected map of Europe the Prince is studying appears the wrong way round. 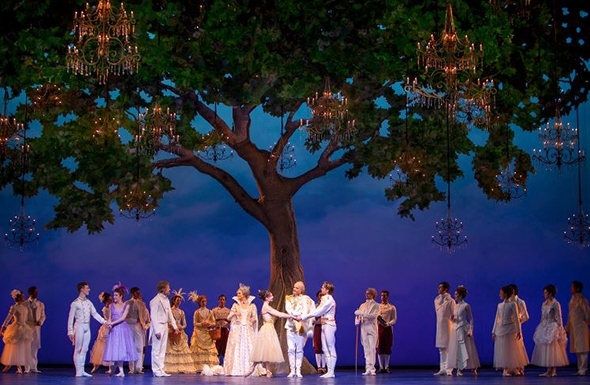 Twist’s contribution is the magical image of the carriage that flies Cinderella out of Act 1 and a tree that we see grow from Cinderella’s tears on her mother’s grave into a glorious green arbour that embraces the entire wedding party at the end. It is this tree that reveals the true arc of the story. Wheeldon’s version of Cinderella is a co-production with San Francisco Ballet and Dutch National Ballet. Both companies wanted a new full-evening work from Wheeldon; the former settled for a new Cinderella and the latter didn’t have one in its repertoire. Clearly fairy tales (not to mention Shakespeare’s and Lewis Caroll’s tales too) and ballet go together and have commercial appeal, but the formula is essentially looing backwards. I can’t help feeling Wheeldon’s talents would be better used to look forward to a new kind of work on his own terms. His imagination seemed to blossom in his single-act non-narrative works for San Francisco Ballet — Ghosts and Number Nine, in particular, that the company presented at Sadler’s Wells in 2012. British ballet has been searching for a new form of full-evening classical work ever since the death of Sir Kenneth MacMillan almost 25 years ago. With his experience of the classical form, his creative team, and as both Sadler’s Wells Associate Artist and Artistic Associate of the Royal Ballet, Wheeldon is in the right place at the right time to find it.